The talented Mr. Ripley, our first 29er trail bike, has been in production for 4 years. During that time it's grown a little burlier, a little longer, and become slacker. With the Generation 3 release, we've added clearance for the new generation of not quite plus sized, wide rim specific tyres. It will come stock with pretty much perfect-for-a-29er Schwalbe 2.6" rubber. If you're an enduro bro, and like to point it downhill through rock gardens without using your brakes very much, this new Ripley also has clearance for burly Maxxis 2.5 WT tyres. Both the Schwalbe 2.6 and the Maxxis WT are designed specifically for the wider rims that we've been producing for the last few years. And just like that, the Ripley became even more versatile. 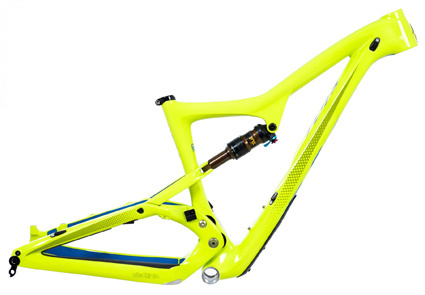 The 3rd Generation Ripley has an all new swingarm and clevis, and a wider upper eccentric. Oh, and new paint and graphics. The swingarm will accommodate 29" tyres like the Schwalbe 2.6" Nobby Nic.